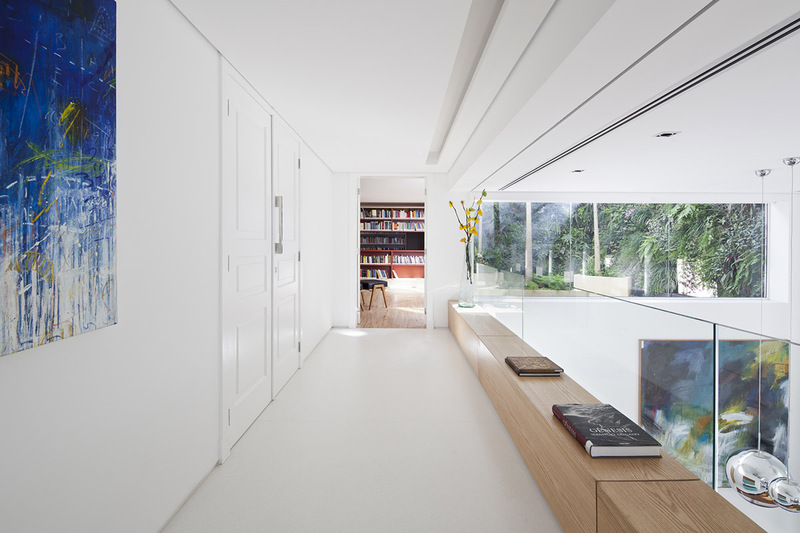 The Ibirapuera Apartment by Casa14 Arquitetura is a never inhabited triplex with an area of 900 square metres in São Paulo, Brazil. 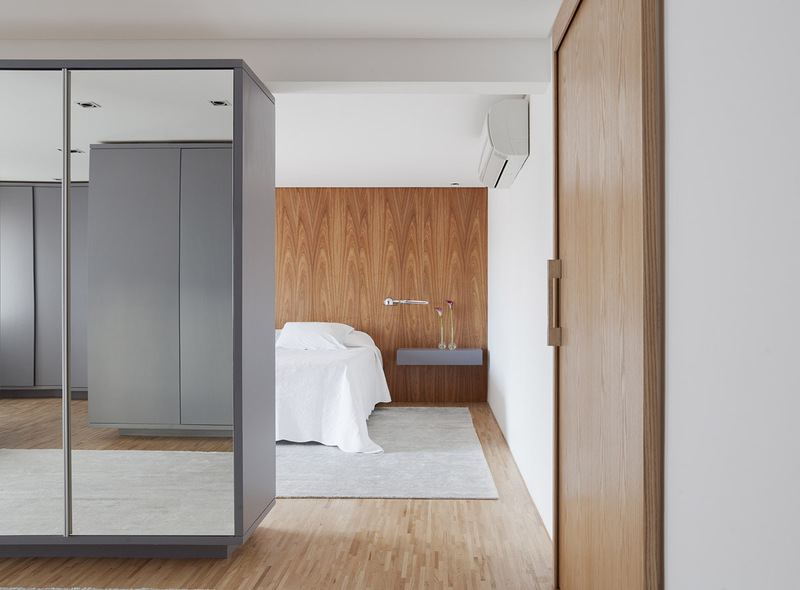 Architects Mariana Andersen and Mariana Guardani opened up the once fragmented and shadowy interior as one airy free flowing environment. 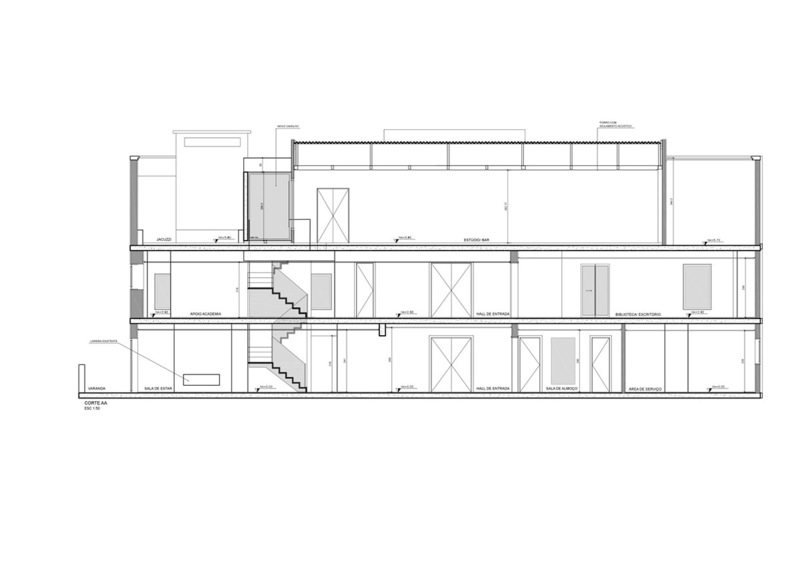 The three floors of the home have taken on a mezzanine construction, which are integrated by a sculptural staircase design of folded steel plate lined with wood and white stone. 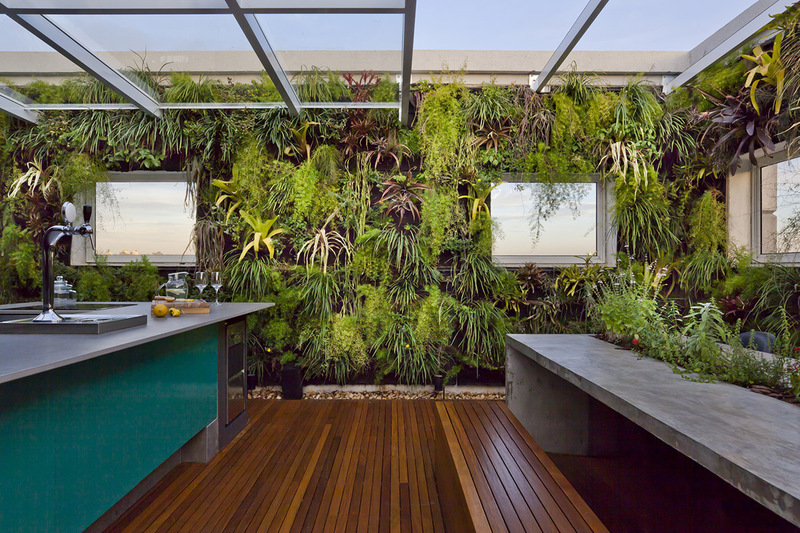 An emphasis on bringing the outdoors inside through vertical garden installations and copious planting makes a jungle of a roof kitchen diner space. 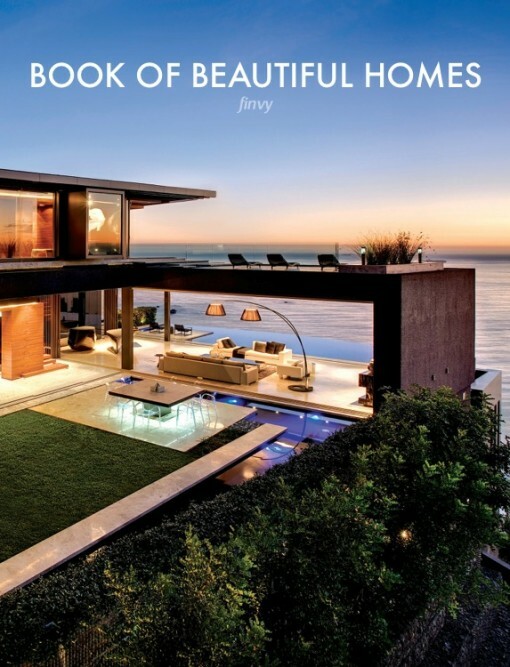 You will also find a sprawling library in this unique home, and a music room complete with mini stage and bar. 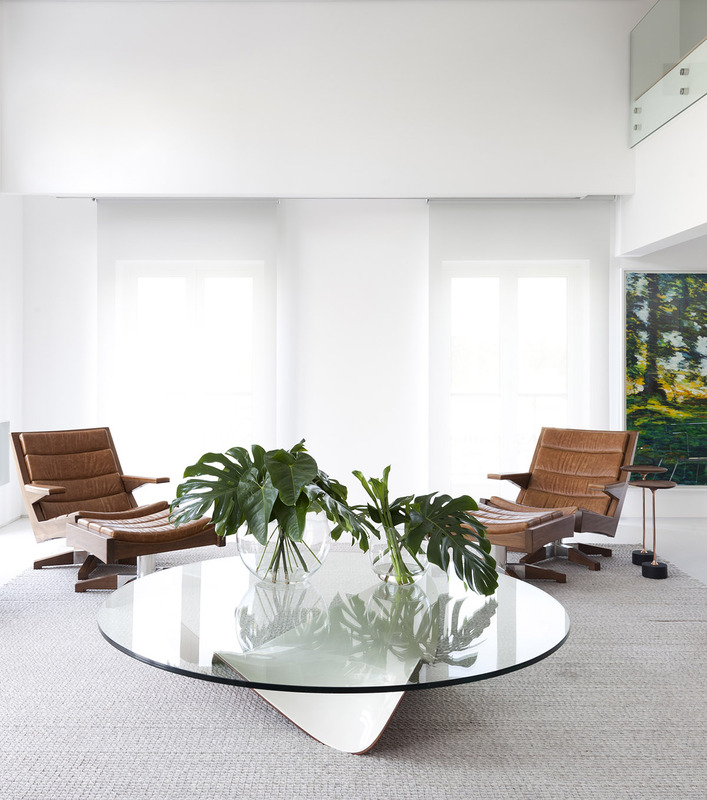 A serene white living room is a welcoming spot in this modernistic home nearby the Ibirapuera Park. 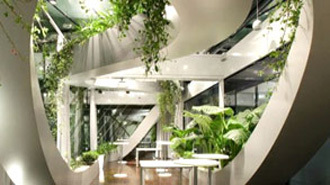 A large glass coffee table forms its centre, topped with a leafy canopy of plants. An arrangement of mix and match seating surrounds the centrepiece. Two brown leather chairs with matching footstools face the sofa. A pale rug holds the furniture arrangement together. A wooden bench seat divides the main lounge space from another small sitting area in front of the hearth. 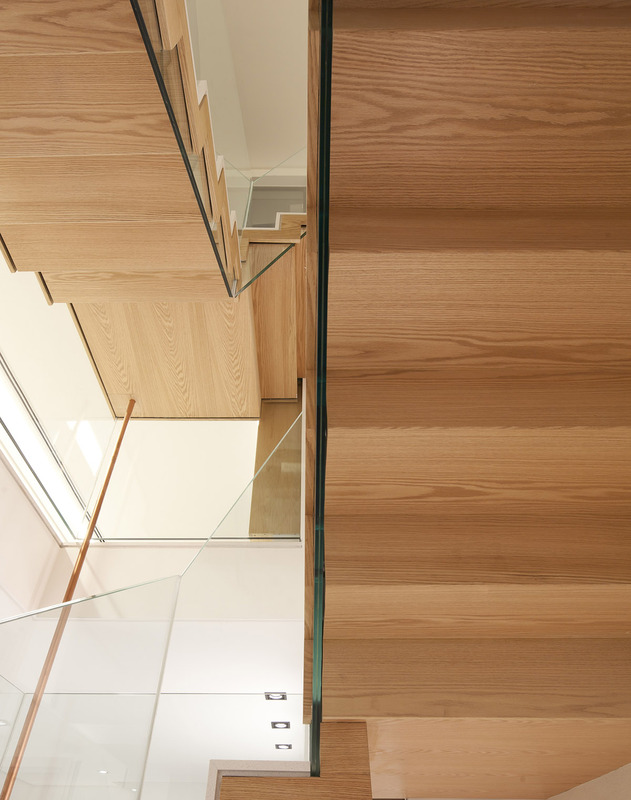 Glass balustrades reveal the modern staircase design. A black rug defines a second set of chairs as an individual sitting area. Going up the staircase, the rooms below can be viewed over and through the mezzanines glass balustrade; a wooden bench seat lines its entire length. Inspirational art is peppered throughout the home, which brings colour and movement to an otherwise still and white wall decor. 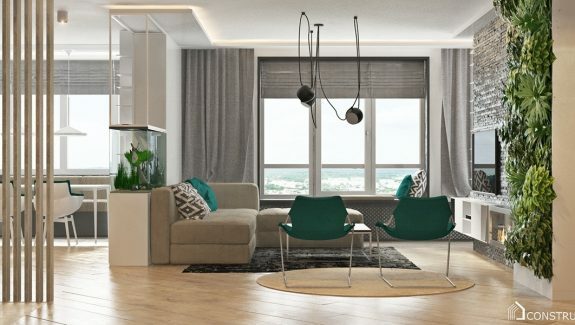 Area rugs add further colourful accents to the room along with some standout modern furniture that sheds light on Brazilian design. A bright blue dining room sideboard complements the colours in wall art. The formal white dining space, which leads off the main living room, reads almost as an art gallery with its impressive curation. 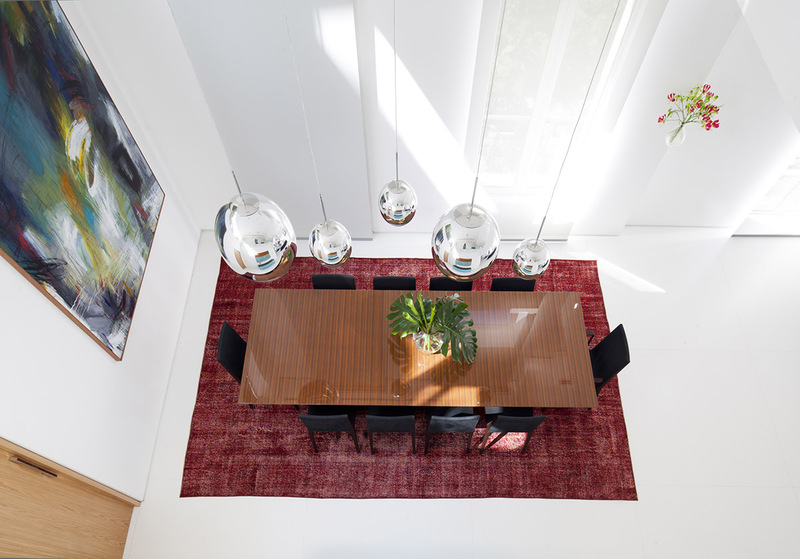 Five chrome orb pendant lights hang above the wooden dining table like a suspended metal sculpture. 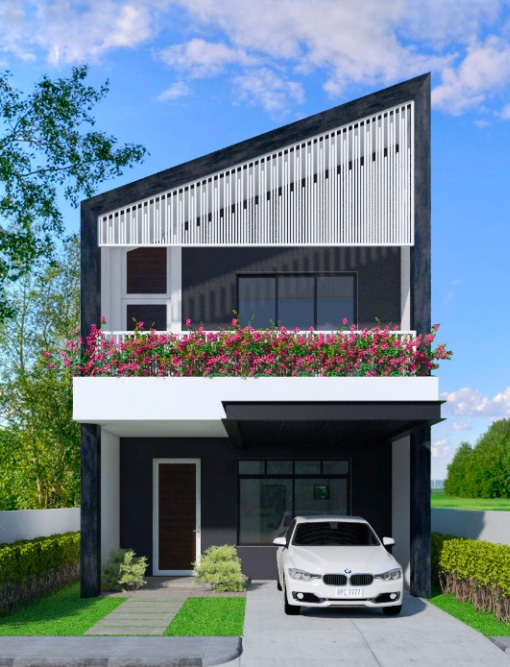 Each level of the home was designed for a specific use: The ground floor for living, the second level for work, and the top floor for rest. Up on the 2nd level there is an extensive home library. Hardback books along the mezzanine bench seat hint at the stacks located beyond the doorway. 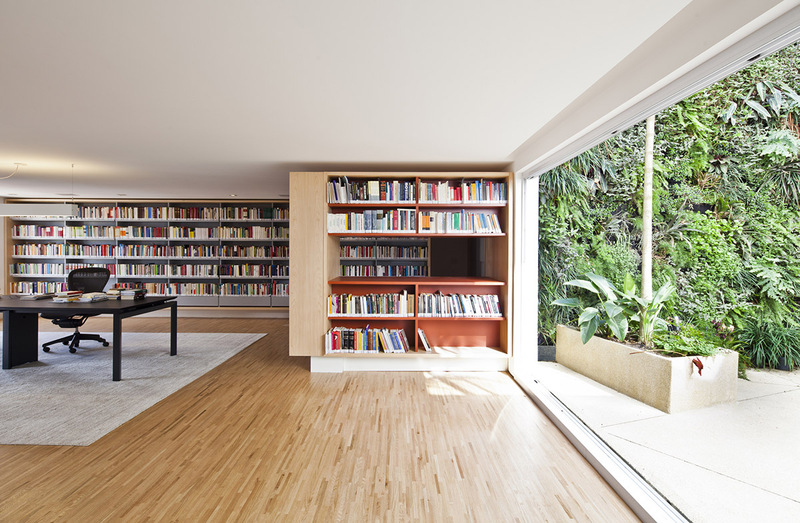 This has got to be a dream living space for a book lover or even a writer! Bookshelves cover just about every wall, holding a library of five thousand titles. A large desk area offers a place for quiet study and writing – as the resident of this house is actually a writer who works from home. A comfortable reading chair, paired with a floor reading lamp, tucked away in one corner offers a more cosy situation in which to thumb through the pages. 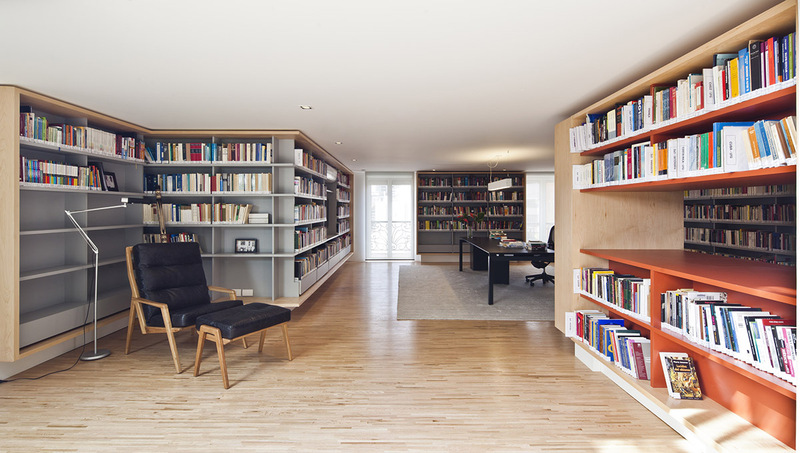 A horizontal section has been omitted from a central bookcase so that the line of sight may pass straight on through, as well as natural daylight from the windows. 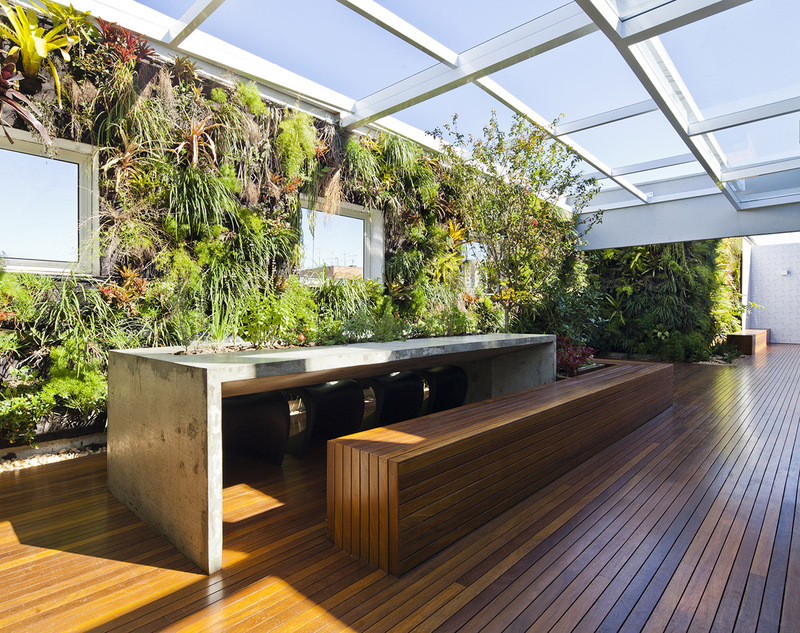 The ‘windows’ are actually huge retractable glass doors that exit out into a beautiful courtyard. 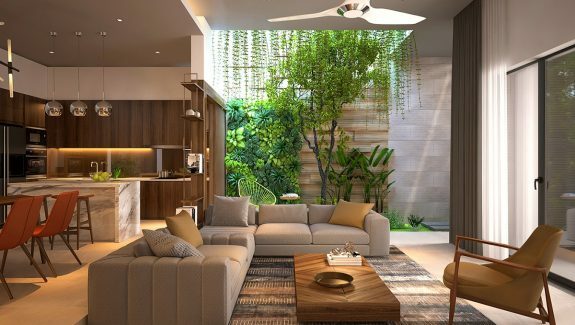 The dialogue between the natural materials of the interior space – wood, glass, light stone and vegetation – and the outer environment makes a luminous and inspiring atmosphere in which to work and live. 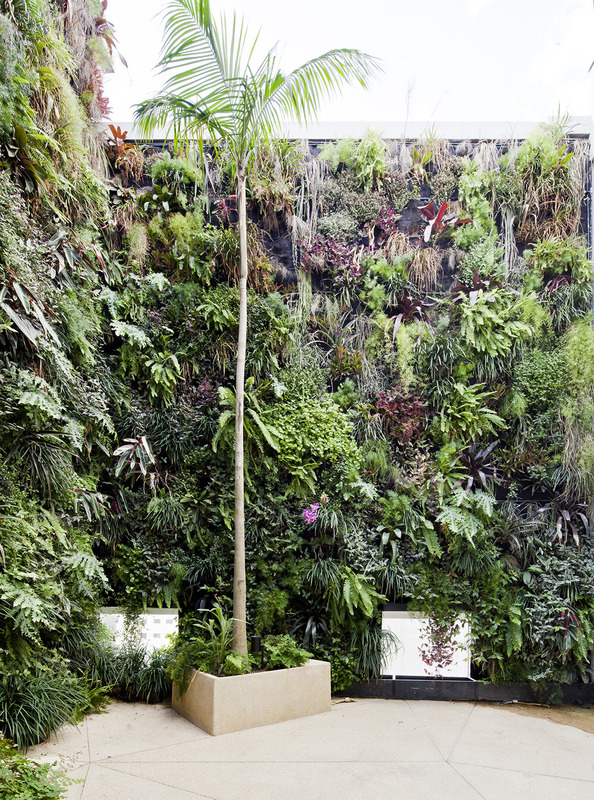 A vertical garden engulfs the walls of the courtyard, sending the leaves of tropical plants tumbling from top to bottom. 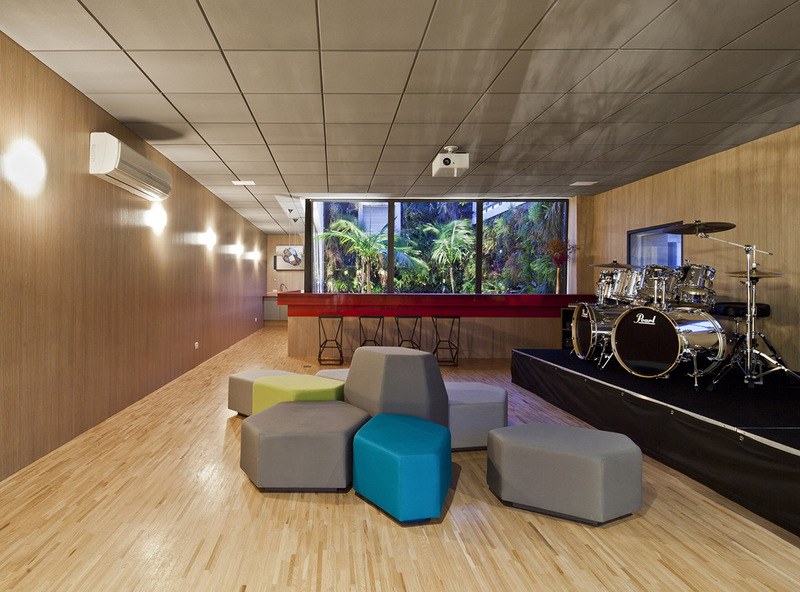 Another courtyard view can be had from a bar area in the home’s music studio, up on the top floor, which also comes equipped with a mini stage. 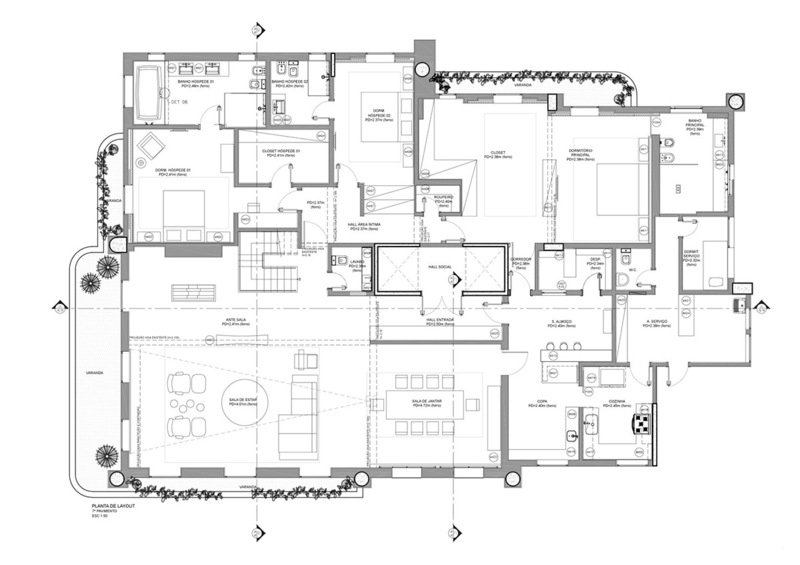 Also on the top floor is an entertaining area that is equipped with another kitchen and dining area. 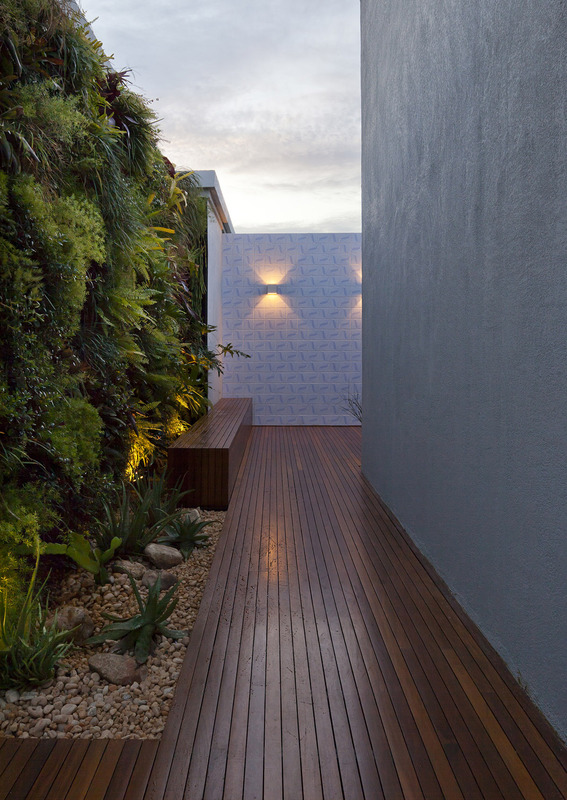 We find another vertical garden here with an overwhelming abundance of plants. 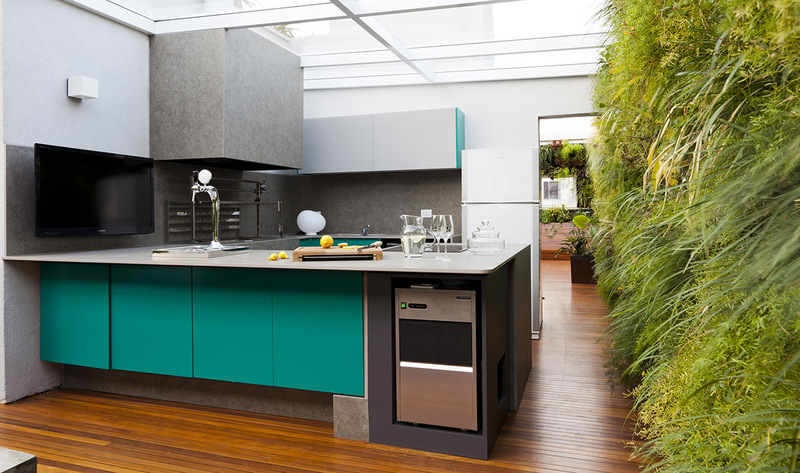 The modern kitchen adds a different shade of green to the mix of foliage. 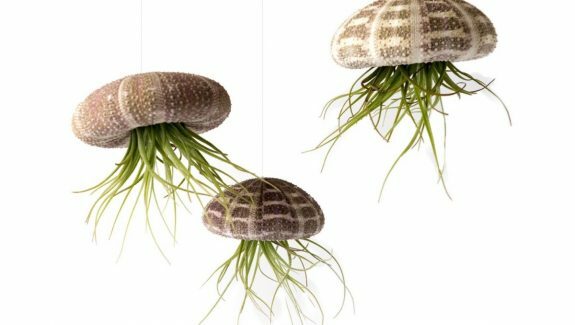 The concrete dining table holds even more planting at its head and down its centre. 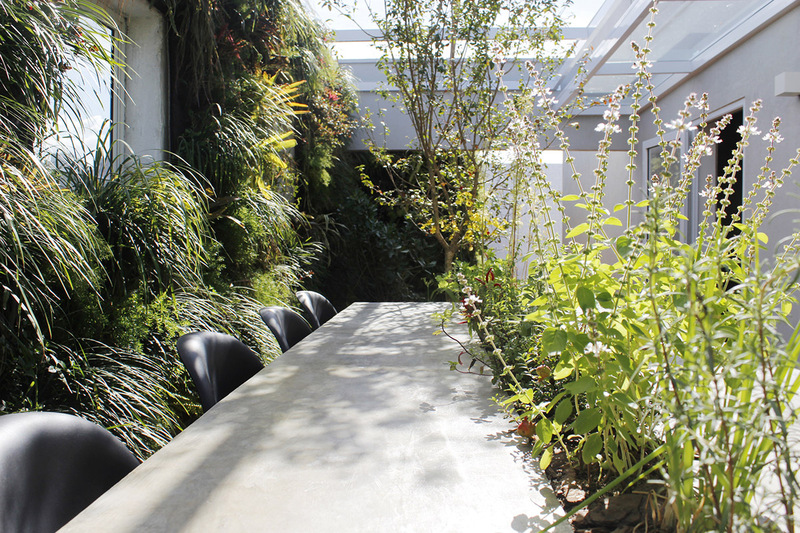 Wild greenery makes this dining spot feel like it’s located in a secret garden. 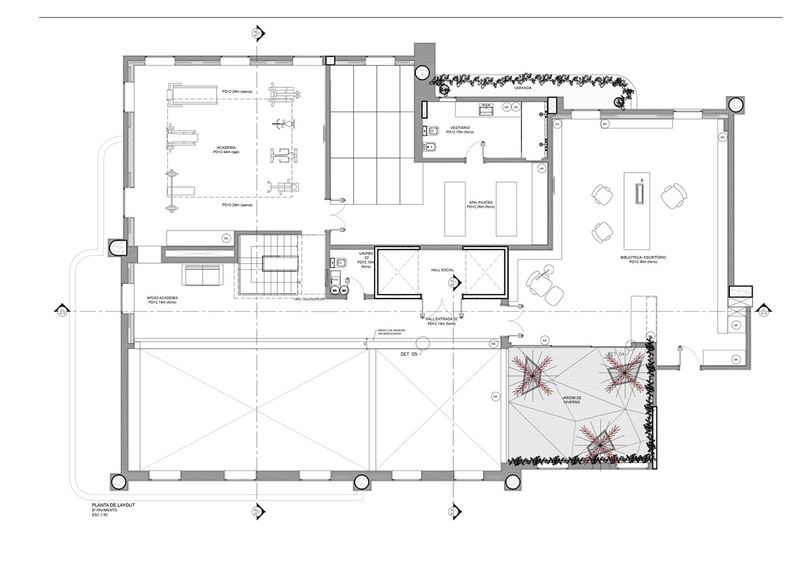 A glass roof shelters the upstairs kitchen diner. 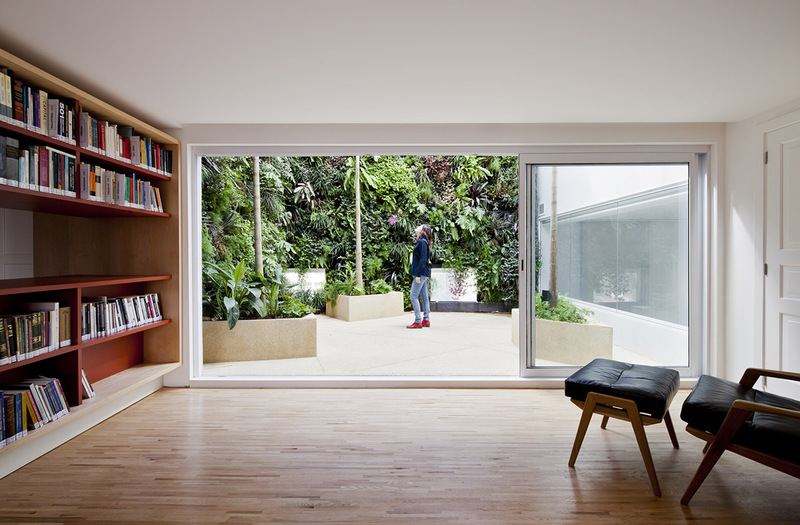 Windows look outward through the foliage. 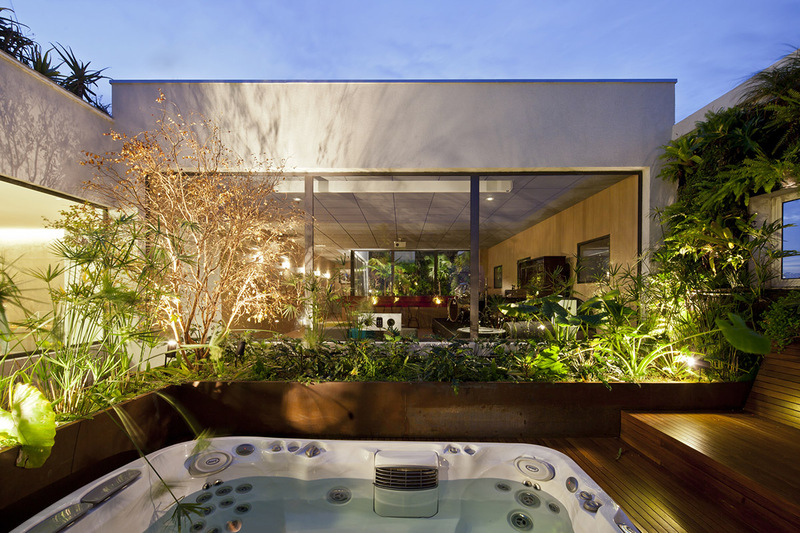 The top floor is also home to a hot tub and a sauna. 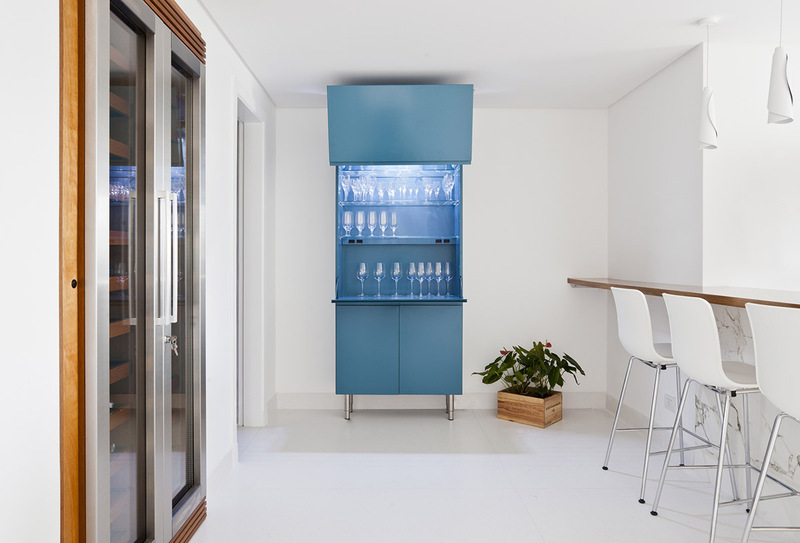 Wine glasses are stored in a blue cabinet that matches the finish of the dining room sideboard. 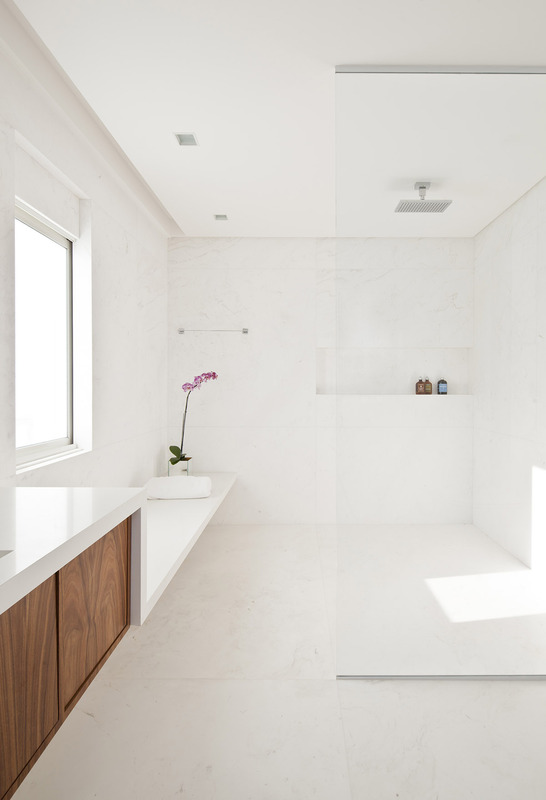 White marble tiling and a smoothly integrated bench seat gives a shower room a minimalist look. 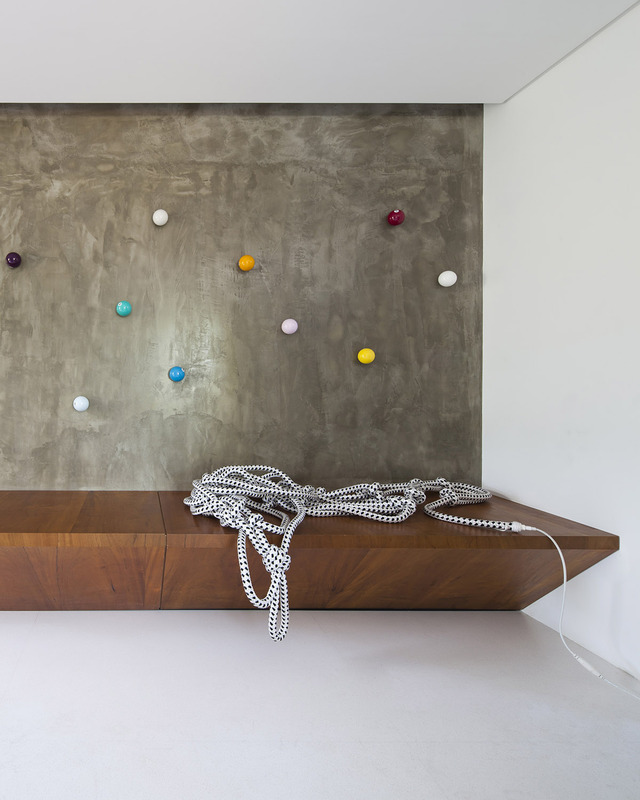 Pool balls climb their way across a concrete interior wall. 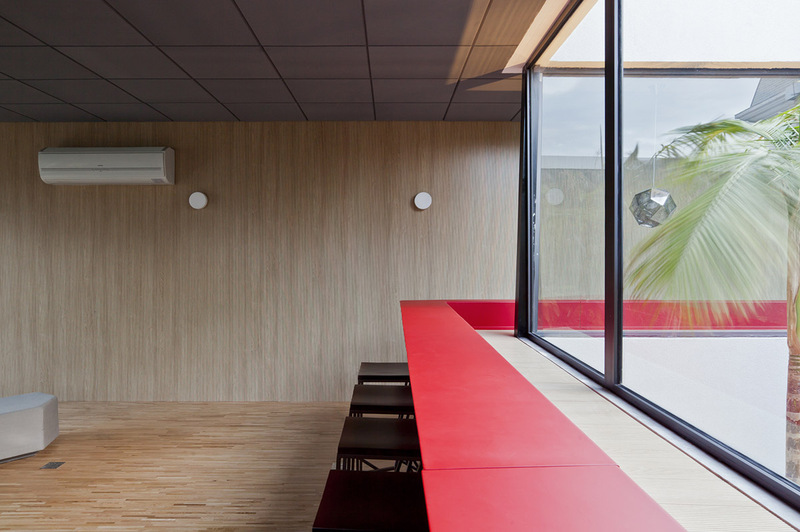 A bespoke wooden bench furnishes the concrete wall. 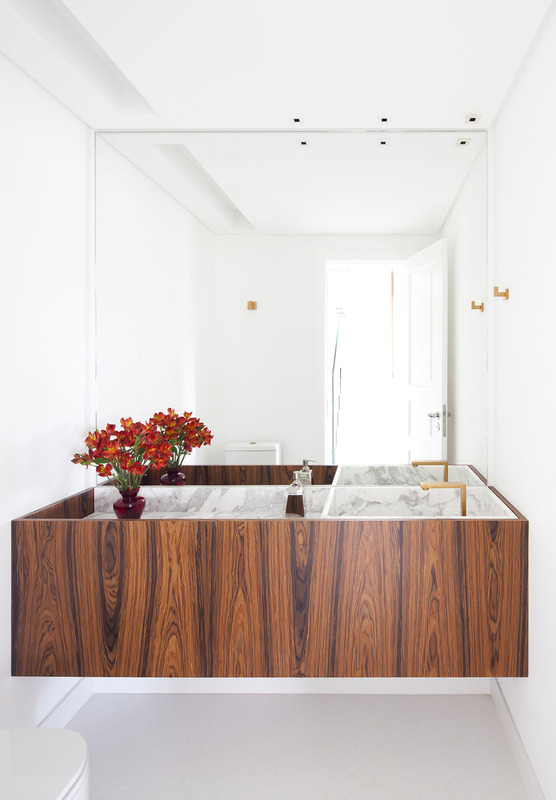 A small cloakroom is fitted with a custom vanity unit, which has a marble basin and a deep sunken countertop. 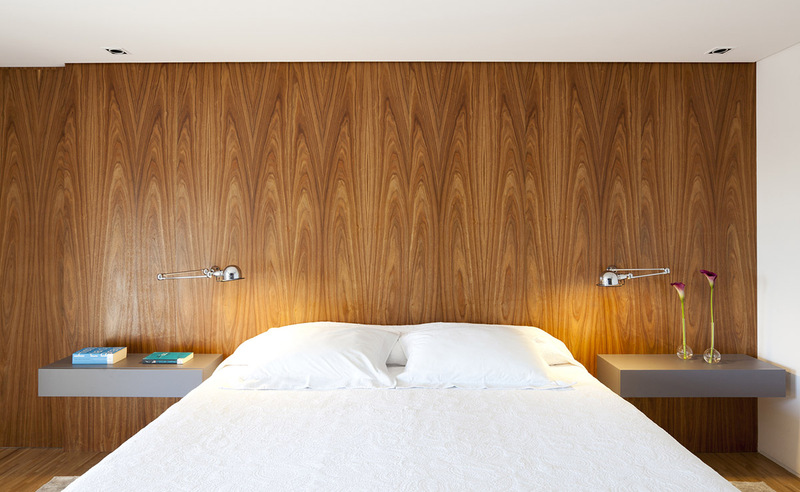 Wood panelling covers a bedroom headboard wall, which is accessorised with chrome swing arm wall lamps and grey bedside shelves. 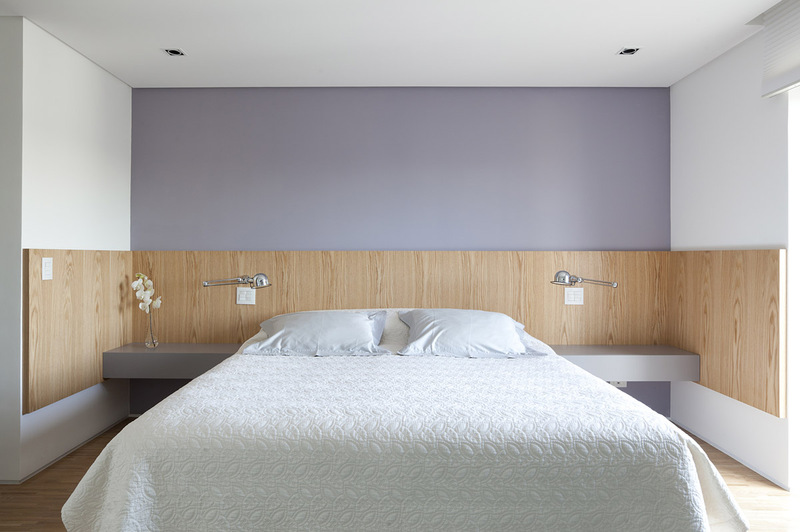 The same decor palette is repeated in another bedroom scheme. Grey closets line a dressing area. 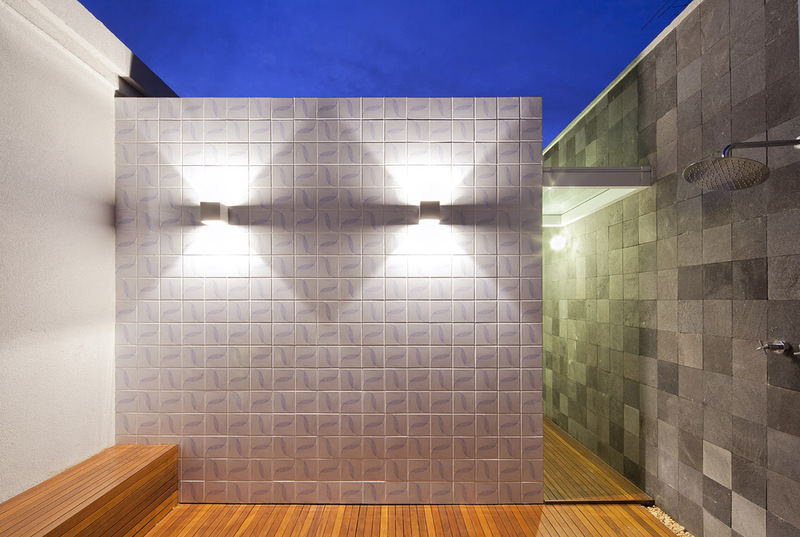 Folded steel plate lined with wood on the bottom and white stone on the top makes up the staircase design that interlinks the three decks of the home. The roof jacuzzi is open to blue skies. Wooden decking runs through the roof area. Red bar tops in the music studio bring a flash of colour. 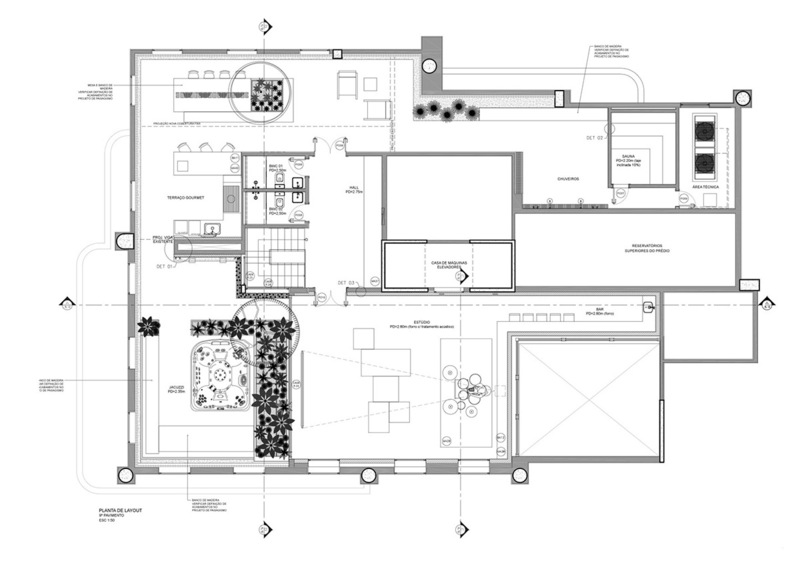 The top level of the home accommodates even more bathrooms. 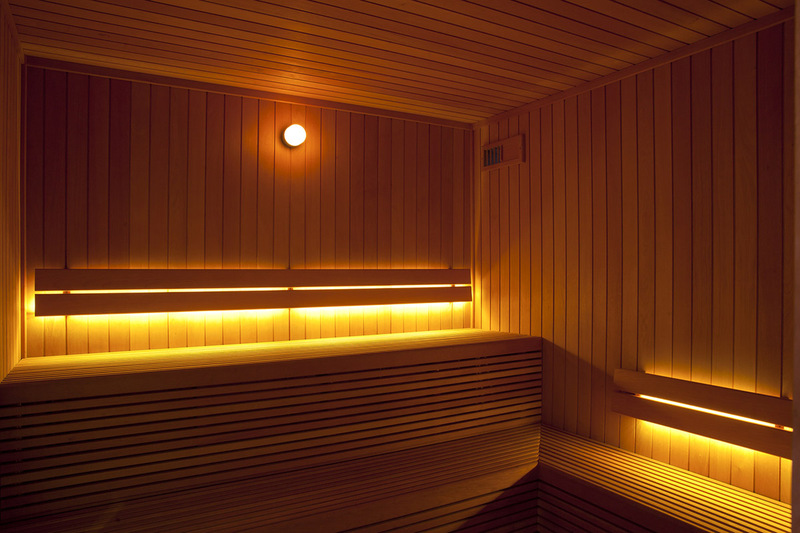 Ambient lighting makes an intimate atmosphere. 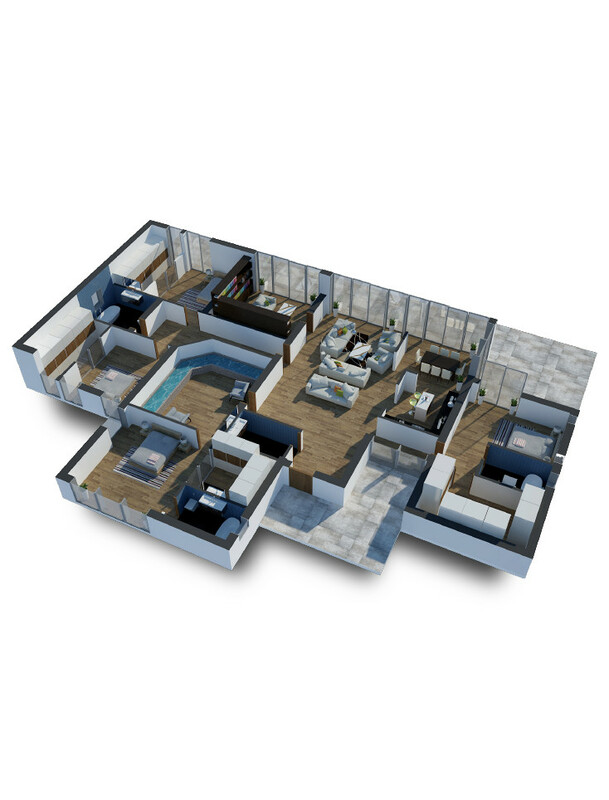 The ground floor of the home holds the living room, formal dining room, kitchen and service area, along with bedrooms and bathrooms. 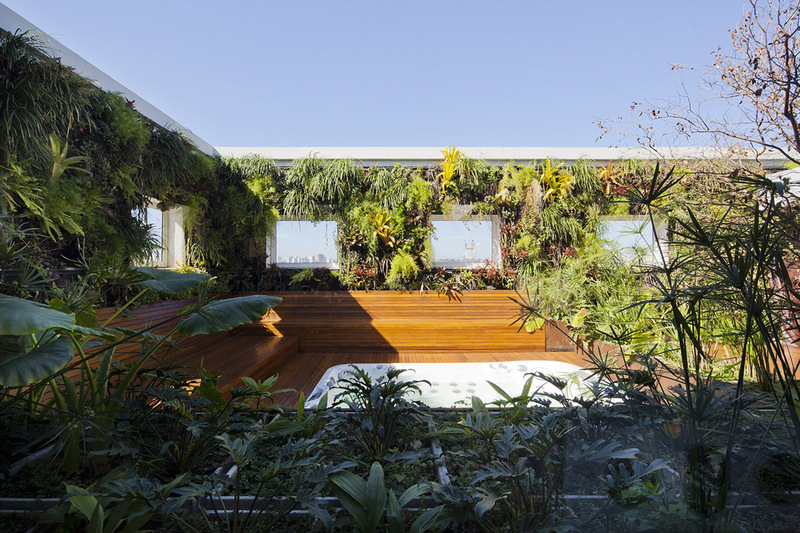 The top floor is the home’s leisure area, which has the music studio, a hot tub, sauna and barbecue, permeated by a vertical garden. 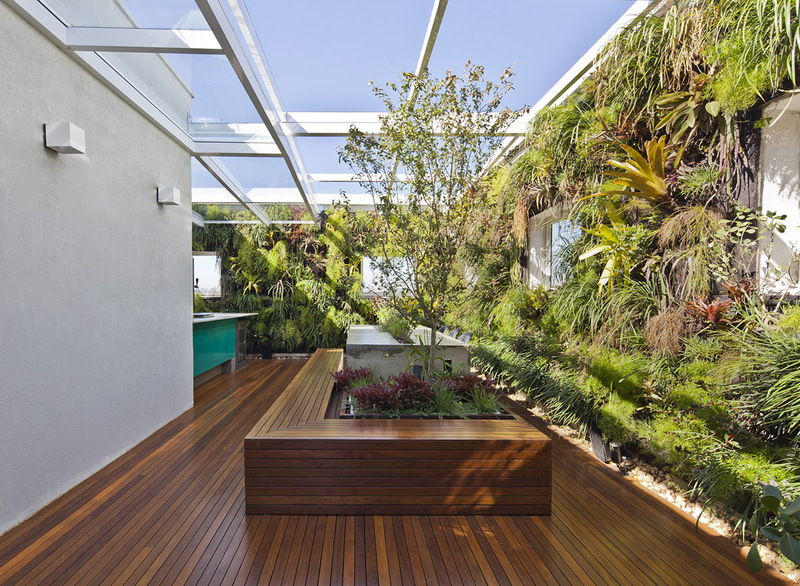 The mid level has the extensive library that is integrated into the courtyard garden, where the resident works, reads and writes.